All the ancient boundaries of the parish of Datchet run along either the river Thames, smaller streams or other watercourses, and it was always liable to severe flooding. The formation and early development of the village depended on slight rises in ground level where dwellings could be safely built. A stream used to run from the north alongside Slough Road, widening to a pond where the Greens are now. This stream continued across Marsh Field (our recreation ground) and eventually reached the Thames near the Wraysbury border. The pond was culverted and the area was filled in by about 1840, creating the dry land of the Greens, but it still runs underground in its brick culvert as a drainage channel before opening into the ditch across the recreation ground near the Village Hall. The north side of The Green is the oldest inhabited area of Datchet. The site of the church is ancient, probably representing a prehistoric settlement on one of the few spots of high ground alongside the Thames. At least by late Saxon times (around 900 AD) there would have been a timber-built church and by about 1100 the first stone building. In the mid-1300s most of the dwellings clustered around the church and to its west were owned by St George’s Chapel (present Old Priory and its grounds) and Eton College (present Old Bank, Bank House, and Pharmacy), but nothing remains of the medieval houses on these sites. Buildings on the north side of the Green (or the pond) took advantage of the raised dry ground, but the lower marshy land on the opposite side was not occupied until much later. The whole of South Green, from the present Library to the Manor Hotel, was owned by the Lord of the Manor, and the Manor House range was built there from the 1500s. The present Manor Houses and Cottages date from the 1600s, their interiors remarkably little altered since then although their facades were fashionably updated in the eighteenth and nineteenth centuries. Apart from the northern side of the Green, this is the oldest inhabited road in the village, serving the Thames ferry to and from Windsor Castle, and then from 1706 leading directly onto the bridge which replaced the ferry. Several of the present houses have their origins in the 1500s (Old Bridge House, Number 20 The Hall House, Goodwyn House), and they are likely to be on the sites of much earlier buildings. Previous names for this road, found from the 1500s, are the King’s Highway, Thames Street and Stoney Street, the last one suggesting that it may have been cobbled at a time when very few roads were given any sort of permanent hard surface. Back lanes were a very common early development behind a street where long narrow house plots ran back from the main road frontages. With constant passage an informal lane gradually developed just beyond the end of the plots, which then became a secondary frontage with buildings facing on to the Back Lane. As the river frontage turns the corner into Queens Road, Riverside House occupies the site of an old brewery and a little further beyond it is a small 1600s house, formerly Attride’s plumbing business. There was no Windsor Road at all until the 1850s, only a footpath running from behind the old house called The Willows (which belonged to the Lord of the Manor), across the fields which are now the golf course, and on to Windsor. The foot of London Road shares the higher ground around the church and remained clear of the 1947 flood, when rescue operations were carried out from there. Datchet House, built on a prime site so near the church, seems to have been here by the 1500s but nothing of the present house is of great age. The long wall which is such a feature of London Road was built to enclose the gardens in 1748, and until recently a similar wall existed for some distance along the other side of the road, enclosing orchards owned by Datchet House. Church Cottage, on the corner opposite the church, was built in the early 1500s by one of the local Mathewe family, but the ownership of its site can be traced back to the 1300s. The map shows how its plot and two others to its east originally ran between the London and Horton roads, forming the eastern end of the village. These plots include the Astracot house (now three cottages) fronting Horton Road, which was built at about the same time as Church Cottage and by another member of the Mathewe family. From the 1700s Leigh House estate occupied land between Horton and London roads, where its main entrance was by Victorian times, with a lodge and other single-storey cottages to its south. No further development took place along London road until the 1930s. So the origin of London Road is ancient but it was not a main highway until it became a turnpike road in 1768. In the 1600s it was referred to as Churchfield Lane and was the route northwards to Riding Court and Ditton Park rather than to London. It was originally so narrow and awkward that the Colnbrook Turnpike Trust had to buy and demolish two cottages and a barn to widen the road between the churchyard and Datchet House on one side and Church Cottage on the other – still a problem point for traffic now. This was the main route from earliest times through Datchet to Colnbrook and on to London. It led through Datchet Common, which began in a narrow funnel shape widening towards the Horton and Wraysbury boundaries. 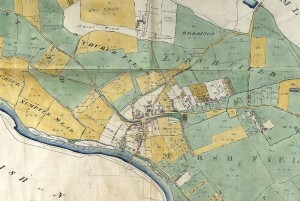 The map shows how early development took place north of the road, perhaps due to squatters setting up homes on the fringe of the Common and establishing rights to live there, something that could not be done anywhere else in the parish. By the 1600s several of these properties had become quite grand houses, including the surviving Lawn and Cedar House, although groups of workers’ cottages remained scattered between them until the late 1800s. By 1839 groups of tiny cottages had been built here by farmers for their labourers, beginning the Datchet Common settlement which almost became a separate village in the late 1800s. At the far end of the road the parish workhouse had been built in the 1780s and was the early focus for development of workers’ housing. Ditton Road was a completely new one made at the time of Enclosure in about 1810, though it probably originated as a pathway into Linchfield. This reorganisation of landowning was carried out by the Enclosure commissioners who also legally established public roads, footpaths and drains, ordering new ones where necessary. Newly created ‘Parliamentary’ roads were typically the straightest roads in any parish — as Ditton Road is in Datchet. By 1834 just a few cottages had been built at its foot, close to Horton Road. 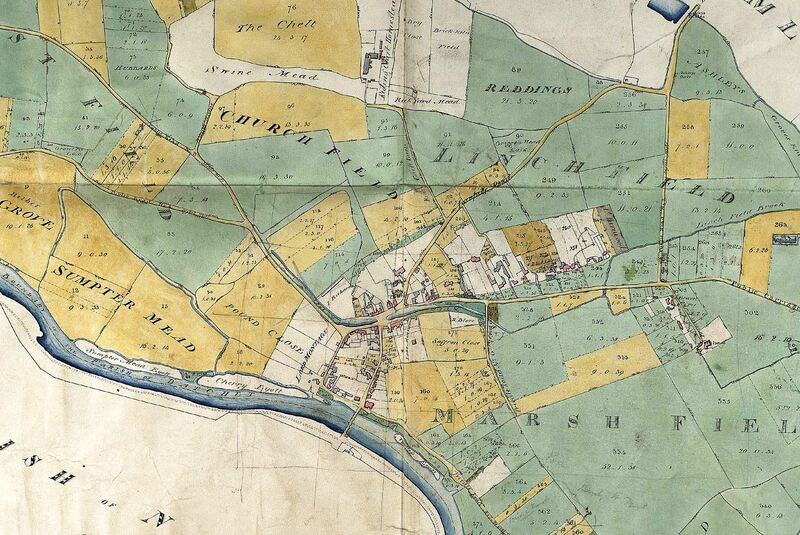 Although there was no building in Green Lane at the time the map was drawn, it was established as an access lane, allowing farmers and labourers to reach the fields which were far from other roads. It had probably been an informal path before 1800, but at Enclosure became an official parish road. Several other access lanes around the village would later become residential roads. From prehistoric times there was a settlement at Southlea, on a high spot of land within a deep bend of the Thames. It may have been continuously inhabited since then because by the 1200s there was a substantial estate there, now represented by Southlea Farm. There was also a hamlet with a farm and cottages on the road, near the present layby, and a substantial house on the riverside which dates back to the 1500s, now represented by the house called Woolacombe. Southlea Road did not then cross the river as it does now, but ended as a narrow lane leading through the farm to a great fishery in the Thames, probably one of those mentioned in the Domesday entry for Datchet. The western end of the village originally stopped abruptly at the top of Queens Road. Until the late 1800s nobody built houses along the road to Upton because it was low-lying and marshy, with a stream liable to flood running alongside it. Similarly, Eton Road, following the same line as the modern road, was then completely uninhabited. Until the agricultural land alongside these roads was sold, there could be no development.